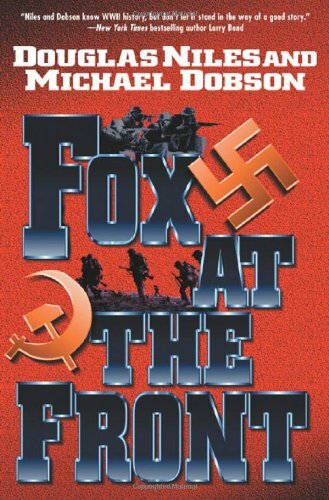 In the tradition of the bestselling novels Fatherland and SS-GB, Fox on the Rhine was the heart-stopping novel of military suspense that showed what might have happened behind the scenes and on the battlefield had a single incident of WWII been different. Now, that alternate war continues in Fox at the Front. A group of disillusioned officers of Hitler’s high command plant a bomb that successfully kills the Führer. For a moment, there is an opportunity for surrender, peace, and survival for all of Germany … but Himmler has other plans. An armistice is signed with Stalin’s Soviet Union. New battle lines result in a very different Battle of the Bulge, where the legendary Desert Fox, Erwin Rommel, meets Blood ‘n’ Guts George Patton. These two masters of modern cavalry tactics must join forces and push to the East, where the hungry bear of Stalin’s army is readying a land grab of all of Eastern Europe, claiming war spoils they ill deserve. From battlefields to board rooms, Niles and Dobson spin an action-filled military thriller, so rich in detail you believe that it could have occurred.